The négoçiant wines from Vincent Girardin have often appeared in this blog. The likes of a Saint-Aubin 1er Cru 2005, a Santenay 2005, a Puligny Vieilles Vignes 2005 and a Chassagne 1er Cru 2005. This reflects their abundance in London restaurants and merchants. Buttery, almond, nutmeg, dried apricots and warm orange. A rounded, rich wine softened by age. A vin flatteur to be drunk now. These wines are after all designed for pleasure not for art critics. 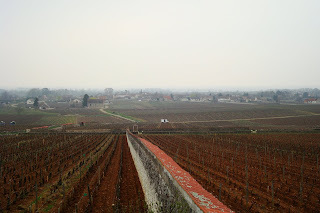 Photo shows Puligny viewed from the golden slope in early April 2009.